This item is an Art reproduction from my original painting. 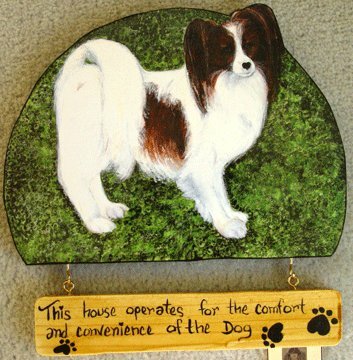 Darling PAPILLON dog handcrafted on 3/4" thick wood and protected with multiple coats of clear gloss high quality varnish for easy cleaning with a soft wet cloth; sign is ready to hang from a brass loop hook. Every wooden sign is carefully crafted and outlined on edge for a nice finish; the hand writting lettering is done with a fine tip brush ( no mechanical pen used here). Turn this wood sign into a one of a kind gift by choosing your own words to personalized your PAPILLON sign! This is a brand new item! Excellent for gift giving. Item measures approx: 9 " wide X 10 1/2" tall. Every item has been meticulously crafted for quality and lasting beauty; you are buying directly from my studio to your home.